A small rounded tree that has leathery, glossy foliage. 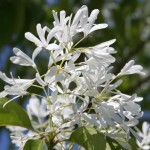 The white, mid-spring flowers are produced in erect 3" long clusters, covering the tree. If a female, purple-black fruit appears in fall. The fall color is yellow. A great small tree that adapts well to urban sites with good moisture and soils.